The apartment was the perfect spot in the perfect neighborhood for us. The hosts were prompt and accommodating. Importantly the space was very clean and the outdoor space on two levels was so amazingly unique, creating quite a bit of natural light as well as excellent eating and reading space. My husband and I found Flavia's apartment to be the perfect place to stay for our 5-night visit to Barcelona. As many others have said, the location simply can't be beat, but all the other aspects were excellent as well. Spacious rooms, comfortable furniture, a well-equipped kitchen, good bed, pillows and linens - no complaints at all. The terraces were what we enjoyed most of all and where we spent the most time - the photos don't show it, but the terrace off the kitchen is quite large and even in winter, half of it was full of sun the whole day. Then when the sun would go behind the church in late afternoon, we'd move to the upstairs terrace for a bit more sun. Two other sets of friends were visiting Barcelona the same time we were, in less interesting accommodations, and they were really wowed by Flavia's place when they visited. Thank you for a wonderful stay! Hi Kim, Thank you very much for your fantastic comments. I am always very happy when a guest enjoy my apartment and that also means that you enjoyed staying in Barcelona. Convenient to all the sights. Fun neighborhood. I am happy you liked the neighborhood and hope you visit us again, next time you come to Barcelona. 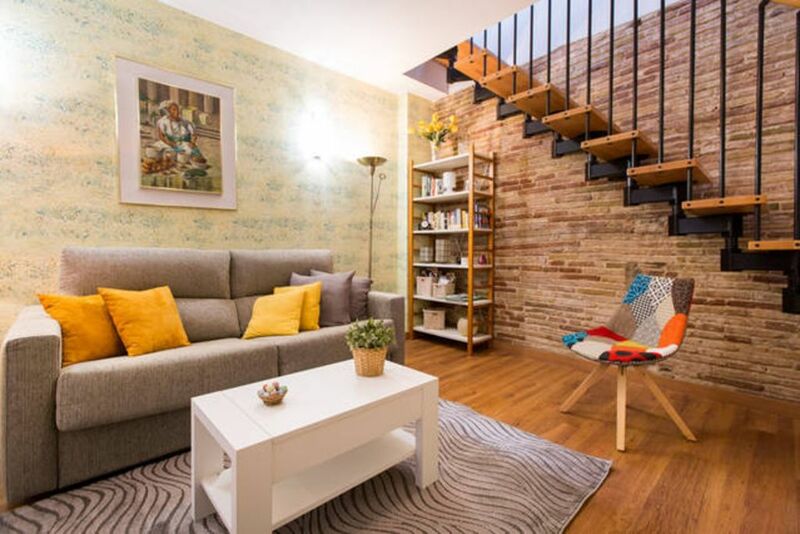 This apartment is located right in the heart of El Born, near shops, restaurants, bakeries, The Picasso Museum and Santa Maria del mar. It is a short walk to the beach, metro stop and Gotic Quarter. The building has an elevator (you have to walk up a couple of short flights of stairs to access the elevator). It is cozy, comfortable and secure (alarm system and locked door from street). Kitchen has some basic equipment and it is a tiny space with a 2-burner stove so you may find it easiest to go to the many wonderful restaurants in the neighborhood. The Santa Maria market has some prepared foods so that makes it quite easy. We did jamon, cheese and cava on the balcony for dinner one night as well as croissants (from Hofmanns) for breakfast. The only problem we ran into is that there is not a dryer and in December we had a difficult time getting our clothes dry outdoors. It would not be as much of a problem in warmer weather or for shorter stays. Flavia and Antonio were extremely helpful and easy to work with. I cannot imagine a better location if you want to experience old town and all it's delights. Thank you Marjorie, for your fantástic comment about the penthouse. I am sorry for the washing problems but as you can saw by yourself, there is not enough space for a dryer. I will try to solve this inconvenient as soon as possible. I am happy you enjoyed your vacation even it was winter. Hope you contact me next time you decide to través. We couldn’t have asked for a better location! Nearly everything was in walking distance. We felt completely safe, and the flat was noise free. The terraces were an added bonus! We enjoyed tapas and wine out there nightly! We loved the view. It’s right across from the church where you can hear the beautiful sound of the church bells ringing hourly. The owner was very attentive, too. The only thing that could use a tiny bit of improvement is the cleaning. The cleaning people failed to remove the garments from the previous guests. Nevertheless, we would definitely stay here again. We absolutely loved it! The apartment is located directly across the street from a beautiful old church, Santa Maria Del Mar, and above a very nice plaza with a few good restaurants. It’s right next to the Gothic quarter and only one block away from the Sea. It’s on the fifth and six floor, with an elevator, so noise from the ground is not an issue. We had problems with our Wi-Fi connection but the owner got involved immediately and replaced the router as quickly as she could. Other than that initial snafu, our stay here was very nice. Once again, you really can’t beat a good location! Thank you for your comments. I appreciate your patient with the wifi problem. I am happy yu enjoyed your stay and the location and hope to see you again next time you come to Barcelona. Thank you again for having selected my apartment. tarifas decrecientes en función de la duración, tarifa en función del número de personas, fianza pedida, arras/deposito de reserva, entrega de llaves realizada por representante propietario . El propietario o su representante pueden ser contactados en cualquier momento de la estancia.